Is 50 miles really slacking? Didn’t seem like it. 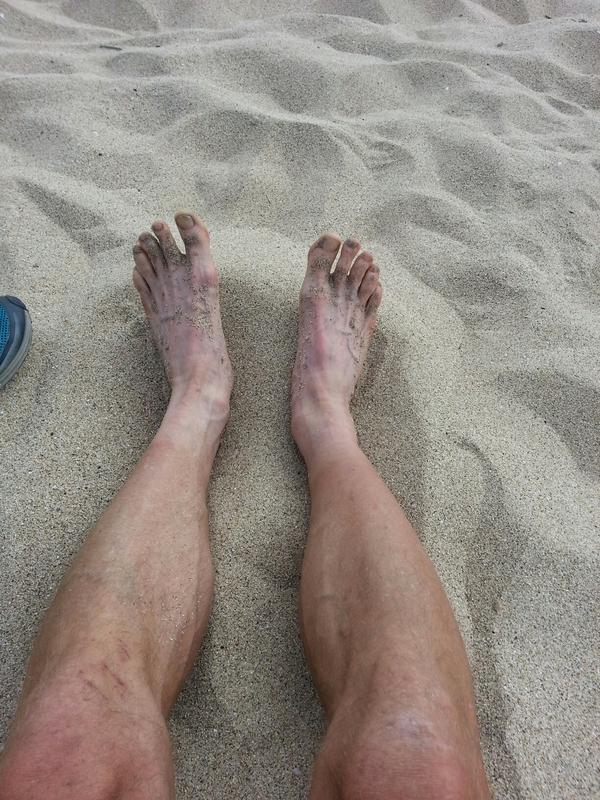 Santa Cruz to Half Moon Bay today. 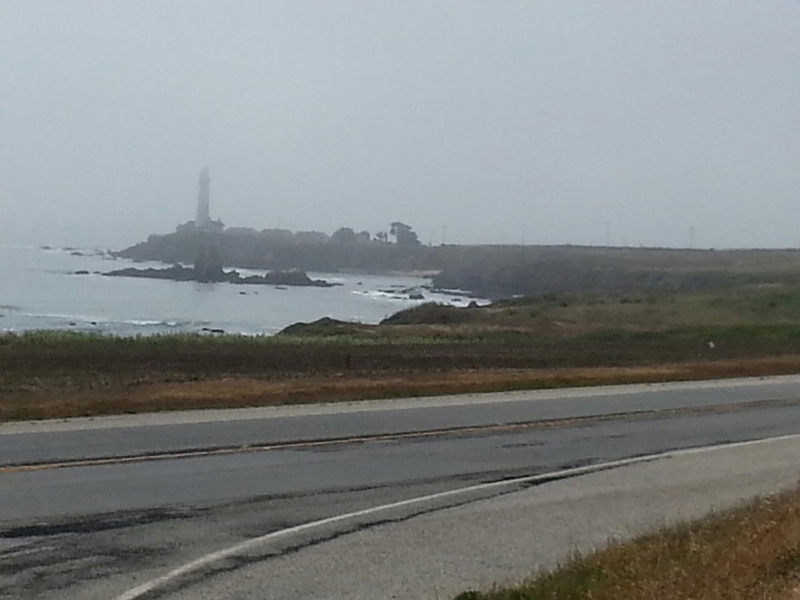 We followed the coast today but hardly got to see it due to the marine layer. We were mostly in a cloud with occasional breaks of sun. With the long climbs, you go from freezing to overheating and back over and over. Zip up, zip down, take out the jacket, put it away. When we did see the ocean and beach, it was really pretty. More rugged shore in terms of rocks in the surf. 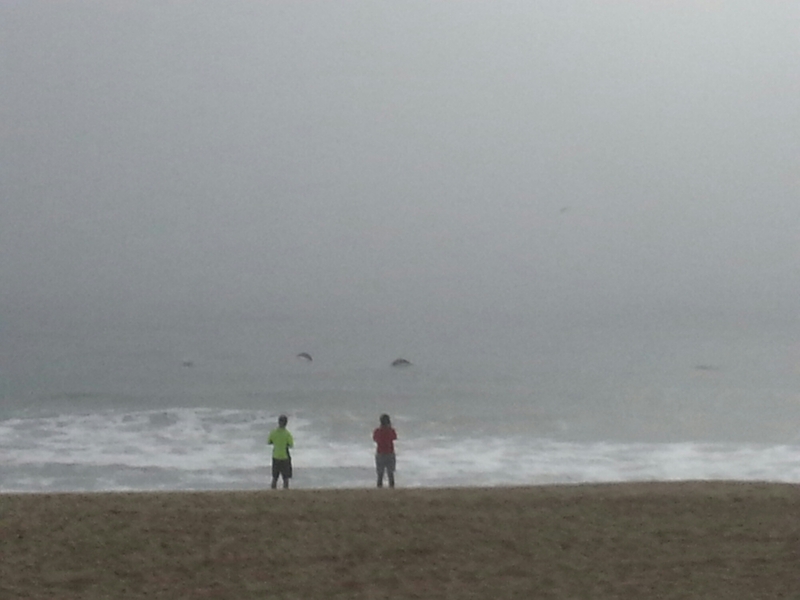 It looked like bigger surf and the surfers were taking advantage of another non-work Friday. I got a flat near this lighthouse/hostel. We were told it had a hot tub. Confession, I blew my tube pumping up the spare. I guess I owe dilly bars to the boys, it was loud. Rookie mistake. We stopped for brunch at Davenport, population 200 at the Roadhouse bar and restaurant. no Patrick Swazey. Breakfast burrito for me because the waitress said they were big. 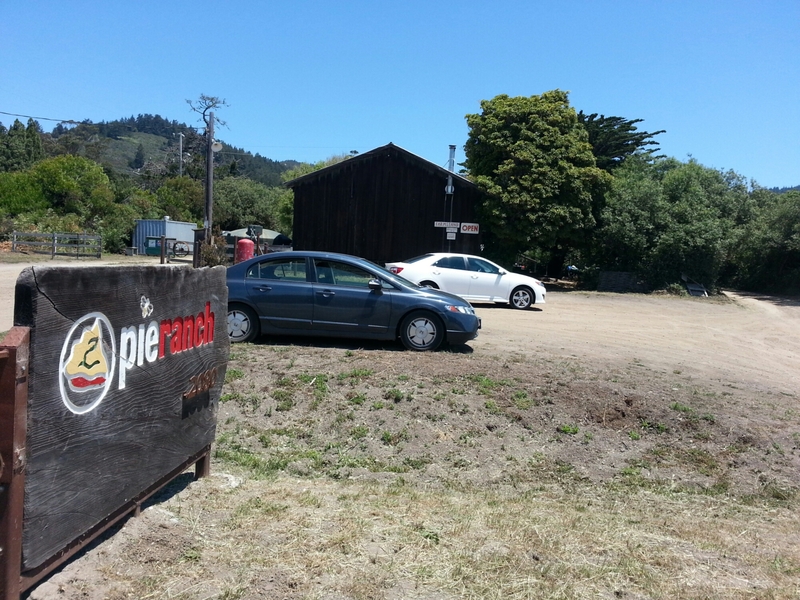 Down the road, we were drawn in by signs for fresh pie at, naturally, the Pie Ranch an organic demonstration farm. We ordered a whole strawberry-rhubarb pie, took it outside to a picnic table and the feeding frenzy commenced. It was gone in two minutes. Another waitress impressed. Not far down the road, we came to The Hwy 1 Brewery. Well, we had to stop. Bob and I had half-pints of the special milk stout. Tasty. Twenty more miles to Half Moon. 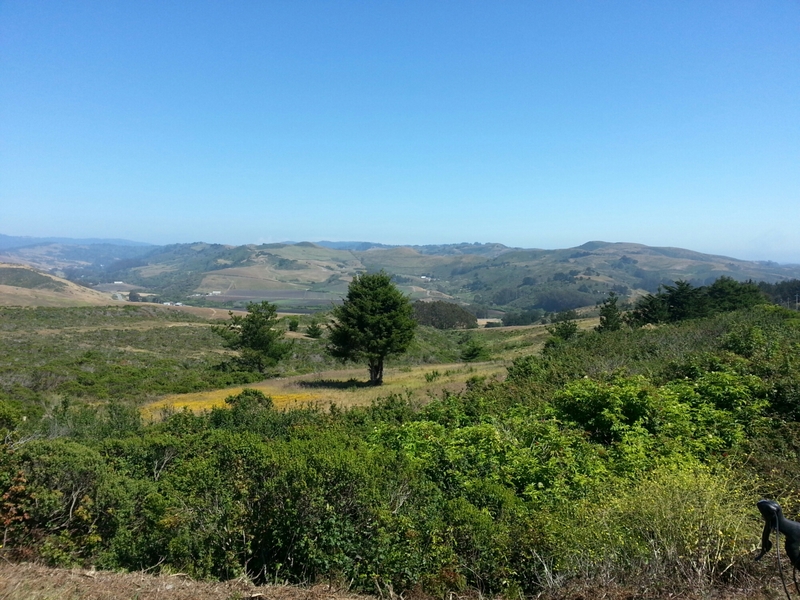 The hills got longer and steeper, steady 7% grade and up to nearly 500 feet in elevation. We made a quick your through “historic”, according to the signs, Half Moon Bay. That allowed us a chance to scope out dinner options. The campground/beach is just outside of downtown. We set up camp and sat on the beach watching large waves crash and seals actually breaching as they swam by. Into town for pizza, but there was Chinese next door and we were drawn in. Top it off with Baskin Robbins ice cream and back to camp. My gimpy leg is still bothering me, slightly swollen and a little yellow. I’m using ice and elevation right now to try to accelerate the mending. OotD: While the scenery here is spectacular, the riding in Minnesota is probably warmer.